Manchester City will be making the first of two visits to Merseyside within a week as they face Everton at Goodison Park on Saturday. After an extended break from domestic action and with many of our key players performing well whilst on international duty, Pep and the group will be itching to return and continue their fine league form. With the league being firmly within our grasp this league fixture holds little relevance but a win here would be another step towards potentially winning the league at the Etihad next month. Without trying to diminish the threat that this Everton team has the potential to pose, this game is being considered (and rightly so) a warm up for the far more important and sterner tests to follow in the coming weeks. Nevertheless, this fixture will still be a good test for the team – due primarily to the fact that City haven’t played a competitive fixture in nearly three weeks. There is some added incentive for City players though, many felt wronged and aggrieved after the 1-1 draw at the Etihad in August and I’m sure they’ll be itching to set the record straight. This does have the potential to be a more difficult game than it should be when you consider some of the relevant factors. No competitive football for an extended period as well as the international break during that time could be a dangerous combination. It’s no secret how demanding and intensive Pep’s brand of football is; it requires high levels of both understanding and practice in the principles that it espouses. When players go away and work under different coaches there will be an adjustment period when they join up with the international squad and when they return to their clubs also. Whether this adjustment period is significant enough to alter this weekends result is entirely dependent on the players in question. Fortunately, City fans are blessed with a collection of some of the most tactically intelligent and skilled footballers in Europe so the odds are that everything will run smoothly. The good news for City fans is that according to Pep everybody is ‘really good’. This could suggest that players such as Mendy and Delph may be close to making their awaited returns to first team action. A clean bill of health for the squad could not be coming at a better time, with several fixtures of huge importance looming large. Whilst the big picture looks good for City, there will potentially be two absentees for the Everton fixture. Firstly, John Stones has fallen foul to a concussion. Whilst Pep has assured the media that Stones is fine and feels great, protocol dictates that there be a period of seven days without competitive football in order for a full and proper recovery. This will be a big miss for City as his passing would be a valuable asset against an Everton team who are all but guaranteed to defend in a deep and compact manner under Big Sam’s guidance. In addition, there are question marks surrounding whether Sergio Agüero will play against Everton. Reports earlier in the week suggest the striker wanted to save himself for the Liverpool game to ensure his best possible performance and news from the press conference seems to echo that. Pep stated that his condition was “much, much better” but that a decision on whether he plays or not will be made before the game tomorrow. Things were looking good for Everton in the wake of Sam Allardyce taking the reigns at the club. There was upturn in form, more goals and a better defence – it finally seemed as if Big Sam was getting an opportunity at a big club and making the most of it. 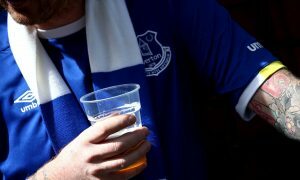 Unfortunately for Everton fans that soon gave way to a return to the issues that had plagued them earlier in the season. A run of 7 games without a win had many fans asking whether Big Sam was the correct person to have been given the job. City will find an Everton team in slightly better form this weekend, picking up 4 wins from their last 7 games. Whilst this seems impressive, they have lost the other 3 of those fixtures which paints the picture of a team riddled with inconsistency. The quality of the opposition that they have been beating isn’t too impressive with three teams (Brighton, Crystal Palace and Stoke) being involved in the battle at the foot of the table. Everton do have some dangerous players to be aware of. Idrissa Gueye will be a thorn in the side of City’s technical midfielders as he will look to shut them down with his work rate and aggressive tackling. The Senegal international’s 3.7 tackles and 1.9 interceptions per game back up his reputation as one of the best holding midfielders found outside of the top four clubs. 2-0 to City. It’s hard to see any other result than a City win on Saturday, no matter how much of a pessimist you may be. Everton are hardly in fantastic form and City’s star players have continued their strong form during the international break. It may not be a stellar performance given the team’s extended break from Pep’s coaching but it should be efficient and get the three points wrapped up comfortably.